I am not going to lie, the last couple of weeks have been a real challenge because I have been trying to stick to a diet and continue to review restaurants and bars (first world problems, eh?). However, I have impressed myself with how committed I have been, so when I was invited to dine at Pier 12 I quickly read the menu to see what I could have that wouldn’t undo my hard work. 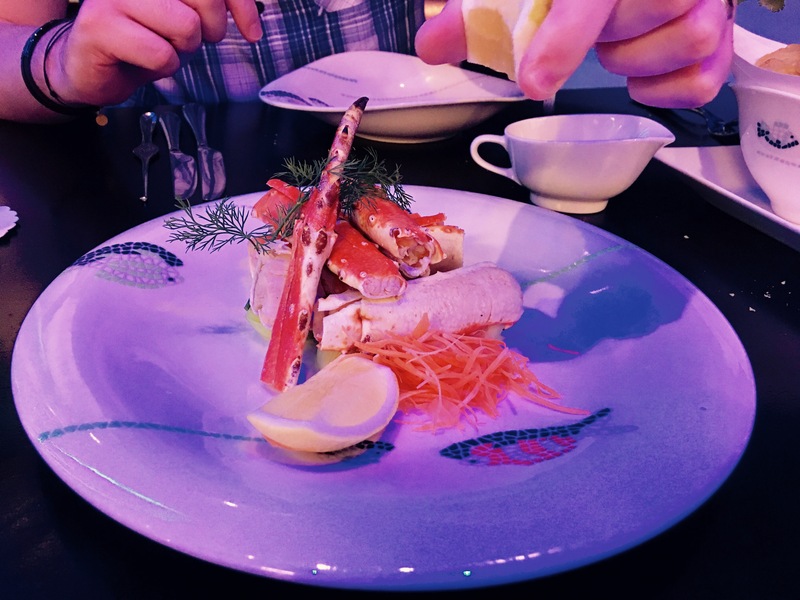 I generally think is quite easy to choose healthier options when eating at a seafood restaurant and over the last few months I have started to eat more and more seafood probably triggered by the excellent crab and lobster I ate in Dubai. Pier 12 is located within the Radisson Blu and, just like Bentley’s Grill it is quite small, it probably only seats about 30 people and has a lovely open kitchen. 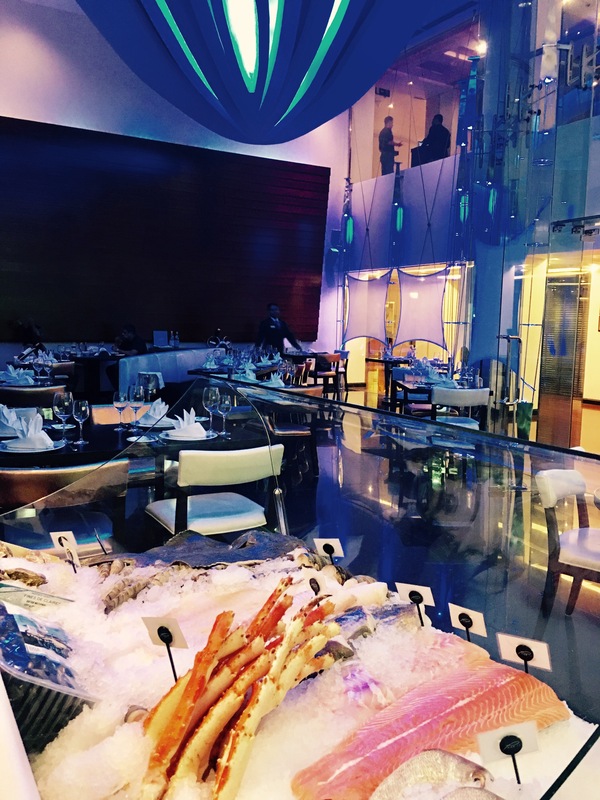 When we arrived at 7pm on Thursday evening a few tables were already occupied and we were immediately drawn to the market trolley which displayed an array of fresh seafood. As well as being able to choose from the main menu you can also order daily specials from the market trolley as a starter or a main course. There is flexibility to have your seafood fried, steamed or grilled and served alongside a range of sauces. We chose to share a starter from the main menu ( battered calamari) and the market trolley (crab legs). Whilst waiting for the starters to arrive the bread basket arrived and it took a lot of willpower not to devour it – the cheesy rolls are delicious. Our starters soon arrived and were nicely presented. 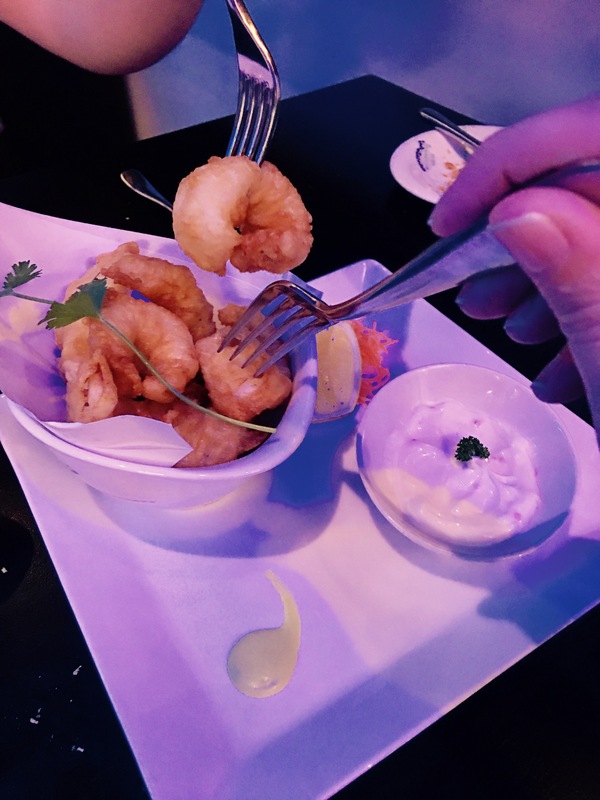 The small of the batter on the calamari immediately transported us back to the seaside! It was light, crispy and not too greasy and the calamari was perfectly cooked. Dipped in the thick mayo it was a perfect match. I think when we go back I would have the fish and chips as this batter is fabulous. The crab legs were deliciously fresh and meaty, I liked that the sauce was served on the side so you could have as much or as little as you liked. 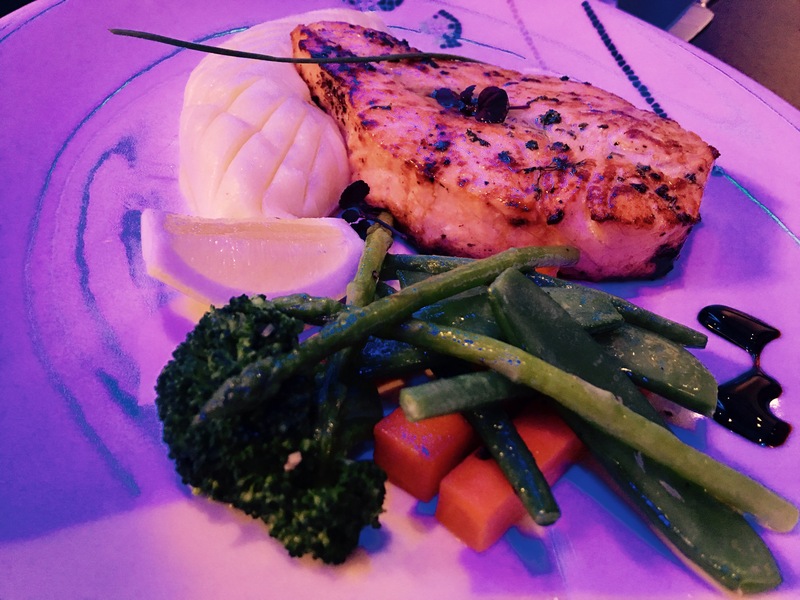 Having taken advice from the staff about the main courses we again chose from the market trolley (lobster thermidor) and from the main menu (salmon). Again both dishes were well presented. 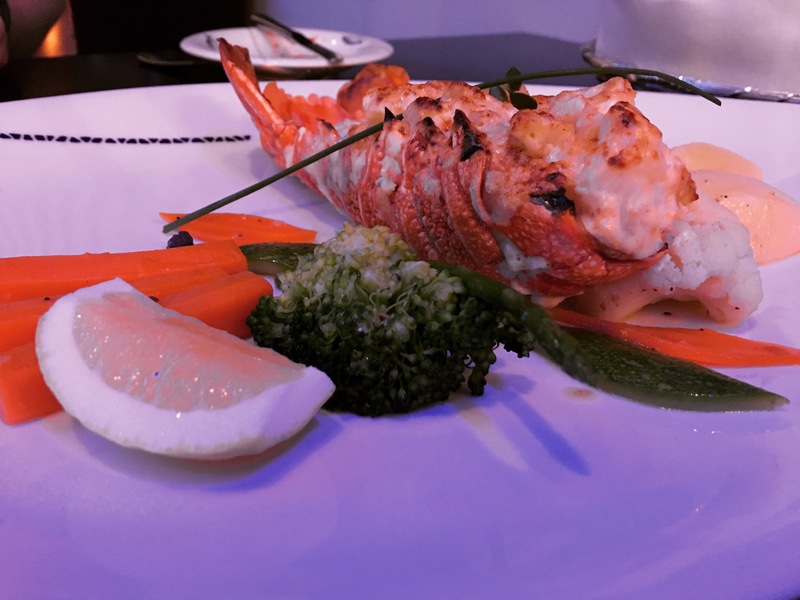 The thermidor was bursting with chunks of fresh lobster in a cream and cheese sauce. It was quite rich however, so I am glad we chose to share the salmon as I think it may have been too much as a dish on its own. The salmon itself was a good portion size and the glaze was quite sweet which balanced out the richness from the lobster. I loved the crunchy veg and creamy mash that accompanied the dishes, everything worked well together. We didn’t choose any sides with our main courses and I think this was a wise decision as the main courses themselves were more than enough. We debated whether to have dessert or not and in the end we decided to share. 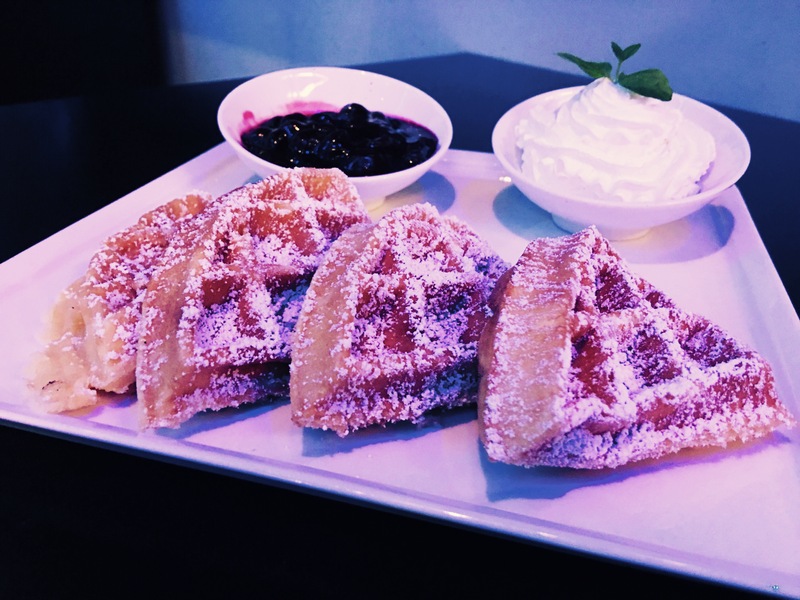 Waffles with cherries, cream and ice cream appealed to us and it was a great choice. Fresh, fluffy waffles with warm cherries and whipped cream. A very indulgent way to end a lovely meal. Our dinner at Pier 12 was fantastic. I loved the attentive but not intrusive service, the option to personalise your dishes and the small, intimate restaurant. 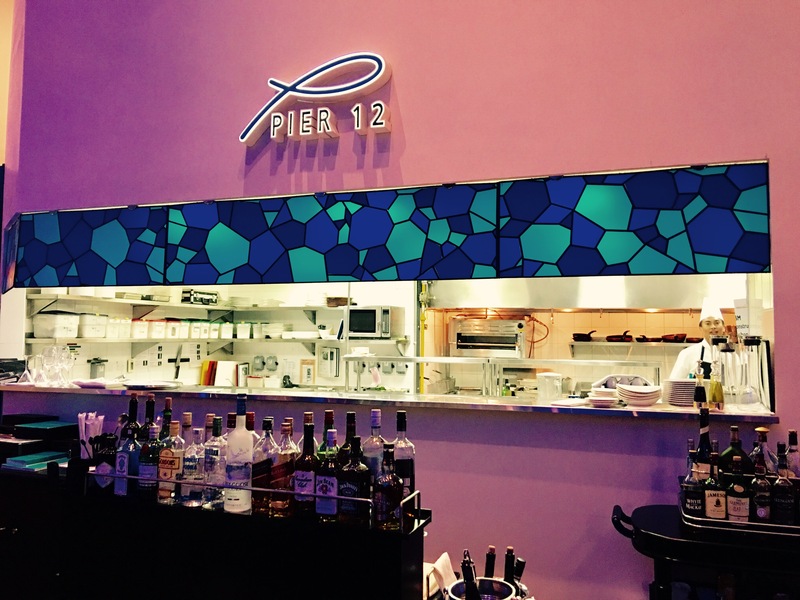 If you are a fan of seafood I definitely recommend you give Pier 12 a try. Also, now its in the Entertainer you can get 241 on main courses including the market trolley. 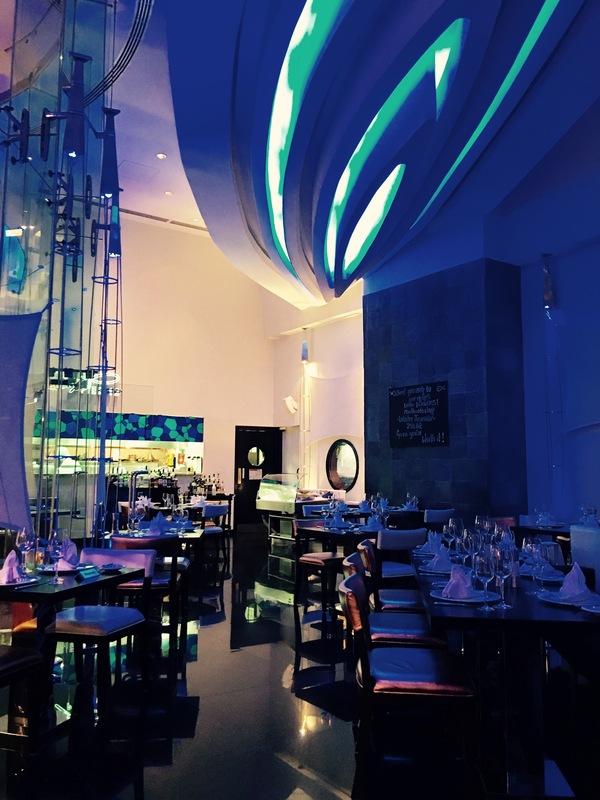 good seafood restaurant doha, pier 12 doha review, pier 12 radisson blu review, radisson blu restaurant doha, recommended seafood restaurant doha, review of pier 12 doha, seafood restauarant doha reveiw, seafood review doha. It was really good. I’m so into seafood at the moment! !